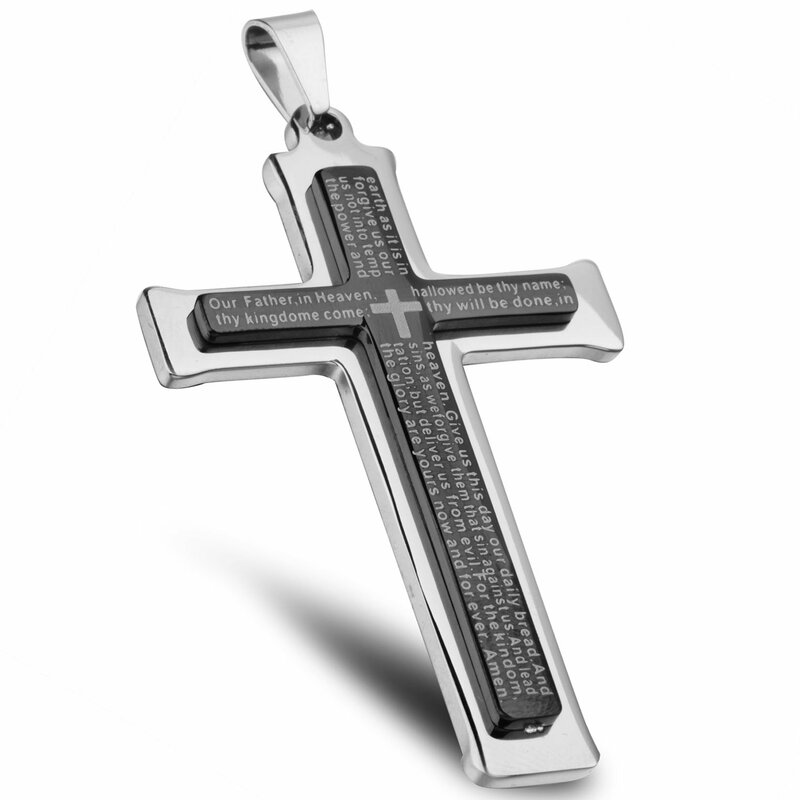 Home › Funrun Stainless Steel Mens English Lord's Prayer Black Cross Pendant Necklac..
Funrun Stainless Steel Mens English Lord's Prayer Black Cross Pendant Necklac.. Double cross pendant. Two-tone, silver and black. Rich layered, three-dimensional. There are five levels of polishing. We use the best five polishing. So that the surface like a mirror-like shiny jewelry. Polishing can further improve the corrosion resistance of stainless steel and light effects. To increase the product's ability to engage in oxidation. We use vacuum plating. More shiny metallic appearance, resisted to rust, corrosion and tarnishing. Engraved English Lord's Prayer.It can be worn as jewelry.It can also be used when in prayer. We use black velvet bag. Emblazoned with "FUNRUN JEWELRY".Flannel bags can be reused, you can collect other jewelry or other small items. Very practical, environmentally friendly. FUNRUN JEWELRY: Your Only Best Jewelry FUNRUN JEWELRY are mainly engaged in all kinds of stainless steel, titanium steel jewelry. Including earrings, necklaces, pendants, bracelets and bangles and so on. Our products are fashion, high-quality and affordable. We are committed to provide you with the latest and most popular jewelry. Choose us, choose fashion! FUNRUN Stainless Steel Mens English Lord's Prayer Black Cross Pendant Necklace,Chain 24'' Pendant's Dimension:(L)61mm;(W)38mm;(T)4mm. Necklace Curb Chain:(L)600mm(24'');(W)3mm English Lord's Prayer: OUR FATHER IN HEAVEN,HALLOWED BE THY NAME.THY KINGDOM COME,THY WILL BE DONE,ON EARTH AS IT IS IN HEAVEN.GIVE US THIS DAY OUR DAILY BREAD,AND FORGIVE US OUR SINS,AS WE FORGIVE THEM THAT SIN AGAINST US.AND LEAD US NOT INTO TEMPTATION,BUT DELIVER US FROM EVIL.FOR THE KINGDOM,THE POWER AND THE GLORY ARE YOURS NOW AND FOREVER.AMEN! Stainless Steel Jewelry of us is your best choose Our products are made of Grade A stainless steel material, they have high resistance to rust, corrosion and tarnishing, which requires minimal maintenance. Buy once and have it all your life. About our Warranty Service When you browse our product, if you have any questions, please contact us. When you buy our products, if you have any questions, please contact us. When you receive our products, if you have any questions, please contact us. When you receive the product within 90 days, if you have any questions, please contact us. We provide comprehensive services, just hope you have a pleasant shopping!